8 huge thalis around India which you just can't eat alone! Interesting photos, thanks for sharing. Personally, I feel that it's a travesty to show off such medley of food when most of it would certainly go waste, in a country like ours. Its even more so as a thali is supposed to be a well balanced meal and usually very good value for money. I've not paid more than 350/- for a thali and my usual comfort level is about 100-150 rupees. In this list, the gujarati and rajasthani thalis are OK - they are usually this way and since you dont get too many dishes at the same time and portions are served as you finish, the wastage is manageable. AojiKhaoji Pune menu. Interesting names for the thalis - including Deepika Padukone Thali. 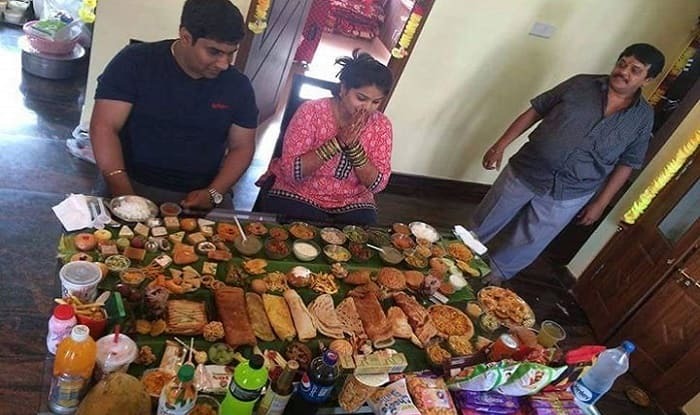 They allow upto 8 people for the bigger thalis. There is such a custom in the US. There are contests where if you can eat it all you all you get it free and prizes & praise. I'll try that in Vegas where you have to sign a health waiver for a waitress dressed as a nurse. The one time I tried such a contest I ate all. However, I certainly didn't enjoy the last third of the heap , diminishing marginal economy..
Food is just like drink . After the second or third serving it becomes a task rather than something to enjoy. I used to be a buffet 'beater' in the past but have now stopped it. I still do it for breakfast (if is included in the room rate[Blush]) and skip lunch. Its thoose simple all you can eat thalis that get me.You nip in for a quick bite to eat between site seeing, 8 rotis and god alone knows how much vegetable lovelyness later the only option is a slow waddle back to the hotel followed by a lengthy siesta. I have done this many,many times and is one of the reasons I am a very lazy tourist,and overweight. I'm hiding in some shrubbery, you can't see me can you? Can you identify this (allegedly) edible (by humans) object ? Don't know which type of bird it is.